Localization Maturity | Language Solutions Inc.
We understand that most organizations do not have the time and internal resources to focus on process management and improvement on their own. Language Solutions Inc. has developed the Client Mentor Program™ to work side-by-side with our clients, guiding and empowering them to take an active role in their globalization and localization initiatives. This assistance and the tools for clients are offered for your success as your translation needs and management of those needs grow. 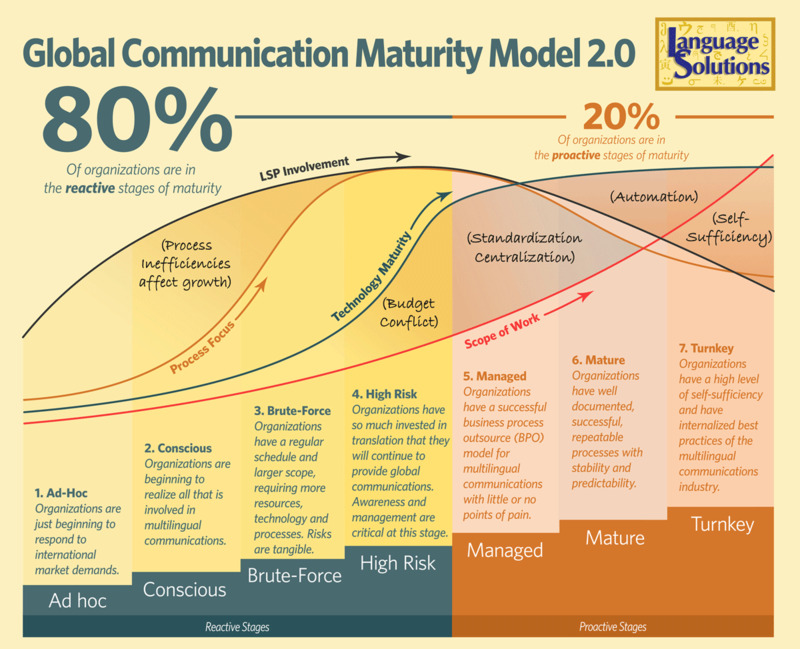 The LSI Global Communication Maturity Model™ 2.0 shows an enhanced view of the stages through which organizations will progress when implementing a global communications strategy. Each stage represents a point in time when an organization faces unique challenges that must be met and built upon in order to move forward on their global business path. Not sure of which stage your organization is in? Take our online assessment to find out. Language Service Provider (LSP) Involvement shows that in the first 4 stages of maturity, the LSP plays an important role in Localization Maturity. In 2009, we set out to build a Balanced Scorecard for our Industry. We wanted to improve the value to our clients and to help them achieve quality and success. We mentor our clients and provide tools for their success that are available within the Localization Maturity framework.